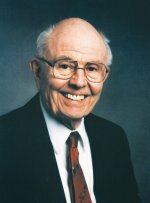 (Littleton, NH) – Frederick Maynard Sundman, who transformed his boyhood love of stamp collecting and his goodwill faith in customers into creation of two of the world’s largest stamp and coin companies, died Wednesday, October 31, 2007, peacefully at Littleton Regional Hospital, of natural causes. He was 92 years old and had resided with his wife Dorothy in Littleton. Maynard Sundman was born in New Britain, Connecticut on October 17, 1915, only child of Frederick William Sundman and Floy Rae Maynard. He graduated from Bristol (CT) High School, class of 1935. He started his first postage stamps for collector business in Bristol, Connecticut the same year, working from his parent’s home with a staff of six. He married Fannie Kasper of Terryville, Connecticut in April of 1941. Following service in the Fifth Army in North Africa and Italy, he returned to Connecticut in the fall of 1945, when he and Fannie moved to Littleton. Together they founded Littleton Stamp Company and its successor Littleton Coin Company. Their marriage endured for 52 years, until Fannie’s death in 1993. Maynard and Fannie Sundman raised three sons, David M. Sundman, Frederick W. Sundman and Donald J. Sundman. On October 15, 1994 Maynard married Dorothy Joslin of Littleton and they enjoyed 13 years of marriage together. “Until recently, Dad came to work nearly every day here at Littleton Coin. He used his trusty 1948 Royal manual typewriter to answer correspondence from friends and collectors around the country,” said his son David, President of Littleton Coin Co.
Maynard was first introduced to collecting postage stamps as a young man. One rainy day, his friend Billy Potter invited him to see his colorful stamp collection that his grandfather had given him. Maynard was amazed by these bits of paper from all over the world. He resolved to collect one stamp of every country, knowing his father would think that a reasonable goal. Maynard soon began answering magazine advertisements offering stamp collections to collectors. When the stamps arrived in the mail, he’d bring them to school to share his excitement. In a short time he dropped his collecting goal and began selling stamps to his grade school classmates. By high school, his dream was to become a full-time stamp dealer. Each summer he would work at his Swedish grandparent’s small farm in nearby Newington, Connecticut. With his grandmother’s encouragement he developed a love for gardening, and he began to raise rabbits. Later he would use money raised from that activity combined with proceeds from trapping muskrats and magazine subscription sales, to invest $200 in the stock market. He doubled his money in six months. He used the proceeds to found his first stamp business in the spring of 1935, from his parents’ kitchen table in Bristol, Connecticut. On Easter Sunday, 1941 he married Fannie Kasper of Terryville, Connecticut. Following the Japanese attack on Pearl Harbor, Maynard joined the Army. He served in North Africa and Italy in the Fifth Army. He received the Good Conduct Medal and the Bronze Star. While he was overseas, Fannie searched New England for a new place to re-start a business once the war ended. Fannie was attracted to northern New Hampshire by its natural beauty and charm and selected Littleton. Before stepping off the train in October of 1945, Maynard had never seen the town. He knew that if Fannie liked Littleton, it was the right place to start a business and raise a family. In December of 1945 they founded Littleton Stamp Company, and hired their first employee. Littleton Stamp Company began in a one-room office in Tilton’s Opera Block on Littleton’s Main Street. Down the street, they lived in a small apartment over the A&P store, just across from the Littleton Post Office. Once customer orders began to arrive, it was Maynard’s daily routine to walk across the street to the Post Office, pick up the daily mail and carry it in a shoebox a few blocks down the street to the office. Today the mail for Littleton Coin Company arrives daily by the thousands in large trucks, and is the largest postal customer in northern New Hampshire. The mail-order stamp company soon attracted a loyal and fast-growing clientele. Unlike his competitors who advertised in stamp collecting publications, Littleton Stamp Co. soon branched out into a wider market, creating collectors through innovative advertising campaigns in consumer newspapers and magazines. Sundman offered customers the merchandise “on approval” to give them a chance to inspect the stamps at home before purchasing them. Later the Sundman firm diversified from serving stamp collectors into marketing coins to coin collectors. In 1974, he purchased Mystic Stamp Company of Camden, New York. “His motto could have been ‘In Customers We Trust,’ because over the years he sent hundreds of millions of dollars worth of stamps and coins to clients on approval,” explained another son, Donald Sundman, President of Mystic Stamp Co., now one of the world’s largest stamp collecting firms with 175 employees in Camden, New York. Donald added, “Over his nearly 70-year career, this mail-order pioneer introduced millions of Americans to the joys of collecting stamps and coins, history you can hold in your hand.” Littleton Coin Company, The firm Maynard founded, today employs a staff of 350. The two firms together handle more than three million orders each year from stamp and coin collectors around the country. To celebrate the Littleton firm’s 50th anniversary in 1995, a book was published about the success of the Maynard Sundman enterprise, A Decent Boldness: The Life Achievement of Maynard Sundman at Littleton Stamp & Coin Company. In 2002 The Smithsonian National Postal Museum established the Maynard Sundman Lecture Series through a donation by his sons, David and Donald. The philatelic Sundman lectures feature talks by authors of recent books on stamps and stamp collecting. In 2003, the American Numismatic Association established the Maynard Sundman/Littleton Coin Company Lecture Series. Held annually in conjunction with the World’s Fair of Money, the lectures offer new perspectives on the science of numismatics. So that all might benefit from these presentations, highlights are printed in ANA Journal, the Association’s quarterly publication of advanced numismatic studies. Maynard Sundman enjoyed both stamp and coin collecting, and serving both collecting fraternities as a dealer. He was a Life Member of the American Philatelic Society, and the American Numismatic Society, and received a 50 year membership award from the Executive Director of each organization in a special joint ceremony held in Littleton on September 30, 2004. Maynard Sundman was a long time member of First Congregational Church of Littleton-United Church of Christ. He was an early incorporator and supporter of New Hampshire Charitable Foundation-North County Region and also contributed to many other New Hampshire charities and organizations, including The Mayhew Program of Bristol, N.H., Dartmouth-Hitchcock Medical Center, and Norris Cotton Cancer Center-North of St. Johnsbury, Vermont. He contributed to every capital campaign of Littleton Regional Hospital. In 1993 he established the Fannie Sundman Memorial Scholarship, a three year scholarship for post-secondary education given to deserving Littleton High graduates each year. In addition to his personal efforts, the company he founded continues to be an important contributor and supporter in the North Country. The Littleton Chamber of Commerce selected Maynard and Fannie Sundman “Citizens of the Year” in 1993. Maynard Sundman is survived by his wife, Dorothy and three sons by his first marriage, their spouses and children: David M. Sundman and his wife Christine of Littleton and their children, Amy, Bethany, and Elyce; Frederick W. Sundman and his wife Charron of Littleton and their children Eric, Michael, Thomas and Katie; Donald J. Sundman and his wife Chacea of Skaneateles, New York and their children Emily and Zachary; Dorothy’s daughter Jeanne Joslin and her husband David Miltenberger; Dorothy’s son Richard Joslin and his wife Debra and their children Stacey, Rachel and Justin, and several grandchildren.